It has been given many names – the Project Management Triangle, Iron Triangle and Project Triangle – which should give you an idea of how important the Triple Constraint is when managing a project. If you’re managing a project, then you’re working with the Triple Constraint. Therefore, it can be easily argued that the Triple Constraint might be the single most important concept in the history of project management. The genius who invented this model is on par with the person who first came up with the wheel. Okay, maybe that’s a bit of hyperbole, but in the world of project management the Triple Constraint is like the invention of the wheel. When used in combination with effective project management software, it can give you the ability to drive your projects to success. Basically, the Triple Constraint states that the success of the project is impacted by its budget, deadlines and features. As a manager of that project, you can trade between these three constraints; however, changing the constraints of one means that the other two will suffer to some extent. While it’s true that the Triple Constraint is an important part of any successful project, it doesn’t determine success. Projects are made from many parts, more than the three, albeit major ones, that make up the Triple Constraint. Sometimes you can’t play around with the Triple Constraint, but those three factors are always at play in the project. Why Is the Triple Constraint Important? Think of the Triple Constraint as the boundaries in which you can work. Just as restrictions enhance creativity, the Triple Constraint provides a framework that everyone in the project can agree on. These metrics drive the project forward while allowing for adjustments as needed when issues arise. Managing a project is often a series of trade-offs and compromises to keep things moving towards a successful completion. The Triple Constraint is a model that helps managers know what trade-offs are going to work and what impact they’ll have on other aspects of the project. By using a project management dashboard, a manager can keep sight of the project as it progresses. Metrics such as the schedule, cost and scope of the project are easy to track. With this information, a manager can identify issues and adjust the Triple Constraint to prevent those issues from developing into problems. The Triple Constraint appears simple, but that’s only on the surface. Each of the three points of this triangle can be unpacked to reveal deeper meaning. The financial commitment of the project is dependent on several variables. There are the resources involved, from materials to people, which include labor costs. There are other outside forces that can impact a project, which must be considered in the cost of the work. There are also the fixed and variable costs inherent in any project, such as the economic cost of teams with varying skills and productivity, which must be calculated. This can seriously come into play with the use of contract workers or outsourcing. Cost processes include cost estimating to figure out the needed financial commitment for all resources necessary to complete the job. Cost budgeting creates a cost baseline. Cost control works to manage the fluctuation of costs throughout the project. Cost is one of the more complicated points on the Triple Constraint triangle. To ensure that your estimates are as accurate as possible, it’s recommended to use project management tools to calculate the cost variances. As mentioned, project scope deals with the specific requirements or tasks necessary to complete the project. Scope is important to manage on any project, whether agile software projects or well-planned waterfall projects, because if you can’t control the scope of the project, you’re not likely to deliver it on time or under budget! When managing scope its critical that you prioritize your tasks, enabling you to plan and assign resources effectively. Without creating a sense of order, it’s easy to become overwhelmed, enabling scope creep. Make sure that you knock out prerequisite tasks so your project can develop smoothly without hangups. Another key factor in managing and establishing scope is handling stakeholder expectations. Stakeholders can often have new demands that popup during a project, and you need to be able to assuage their expectations. This can especially be the case in long term projects where there might be new stakeholders introduced in the middle of the project. In order to accommodate the requests of stakeholders, and new demands that arrive naturally as projects unfold, you need to be able manage change. This can include managing change requests. When managing change requests, be sure to only accommodate those that are necessary to achieve project goals and deliverables. These scope management steps are all essential because the amount of time each task will require is critical to the quality of that final product. This can have a great impact on schedule and cost, especially so if the project is on a large scale. At its basic, the schedule is the estimated amount of time allotted to complete the project, or producing the deliverable. Usually, this is figured out by first noting all the tasks necessary to move from the start to the finish of the project. A Work Breakdown Structure (WBS) is used to take the large project goal and break it down into a series of more manageable tasks. These tasks are then prioritized, dependencies are linked, and then placed on a timeline. A Gantt chart is one way to visualize the project schedule, with each task a point on that timeline, with task dependencies linked, and durations determined. Having historic data can help make more accurate estimates. According to the Project Management Body of Knowledge (PMBOK), the schedule can be managed through a process of time management. Those steps are as follows. Time management is also important at the team member level too. Project managers look to get support from their team in this area, through collaborative time management tools and processes so the project is collectively able to stay on track. When you’re managing a project, some variables can change. Others can’t. The Triple Constraint gives you a firm sense of what can and can’t be adjusted throughout the course of the project. For example, if you’re running behind schedule, you can work to reduce the features of the project. That’s reducing scope. Then you can dedicate more resources to moving the schedule ahead. That’s increasing cost. You can also, if possible, change the due date to give you more time. All these scenarios are applying the Triple Constraint for managing the project. Basically, the Triple Constraint is really a balancing act. It’s like juggling; it looks easy until you try it. And just like a juggling, it takes practice. For a project manager, that means taking the time to understand the Triple Constraint as it applies to the project and doing your due diligence beforehand, so that if you must adjust, you’re doing so from a place of knowledge. 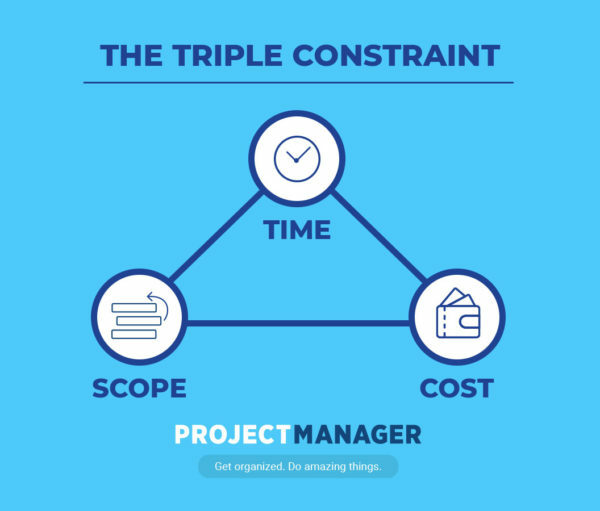 The Triple Constraint will help you manage your project. Planning for the schedule, scope and cost of your project will help you achieve your goals and objectives. ProjectManager.com, a cloud-based project management software, gives you the tools to use this model effectively. See how our real-time dashboards & interactive Gantt charts can help you by taking this free 30-day trial.